Kumejima has a new bus running around the island. The town is situated around the wetland preserve and mountains in the middle of the island. The Kumejima bus service provides routes around the island and to the airport. Starting in April, the new Kumejima Bus started operations. 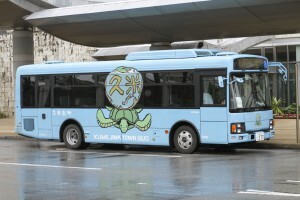 The sky blue bus is quite different than the previous yellow, and easily show’s off its most distinctive aspect, the new logo drawn by famous Japanese animator Hayao Miyazaki of Studio Ghibli. Miyazaki donated the mark to Kumejima in response to their support of children from Fukushima. The mark is now also the logo for GOSEA.